It arrived in Decatur in a massive wooden crate that had to be hoisted off a trailer. Inside was what looked like perhaps a prototype for an early golf cart, complete with hefty tires fit for the worst sand trap imaginable. 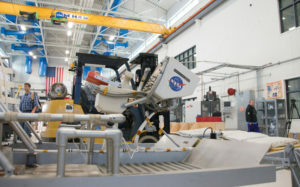 In fact, it was a care package from NASA and the U.S. Space and Rocket Center, which have partnered with the Technologies Division at Calhoun Community College to refurbish a lunar moon rover replica for exhibition around the world. The restoration team aims to reconfigure the static lunar rover replica into an interactive display capable of supporting 500 pounds that will accurately depict the version that landed on the moon, according to project officials. When complete, the restoration project will be visible through the high-bay windows of the Aerospace Technology Center, located on Calhoun’s Decatur campus, according to Nina Bullock, design drafting technology instructor at Calhoun. Students from areas including design drafting, machine tool and welding will work on the project through the end of the fall semester. “We strive to provide our students with as many real-world, hands-on experiences as possible while they are with us, and this project does just that,” Bullock says.